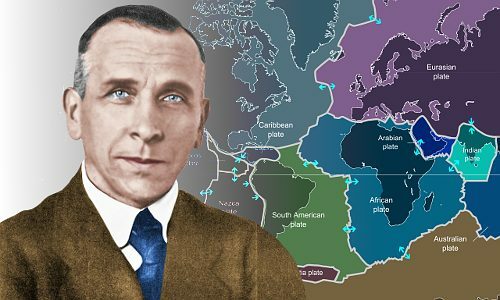 Alfred Wegener proposed the theory of continental drift – the idea that Earth’s continents move. Despite publishing a large body of compelling fossil and rock evidence for his theory between 1912 and 1929, it was rejected by most other scientists. It was only in the 1960s that continental drift finally became part of mainstream science. Alfred Wegener was born on November 1, 1880, in Germany’s capital city, Berlin. His father, Richard Wegener, was a classical languages teacher and pastor. His mother, Anna Wegener, was a housewife. The Wegener family of two adults and five children – Alfred was the youngest – was quite well-off financially. Alfred was an intelligent boy. He received a conventional education, attending grammar school in Berlin. His academic ability at school marked him for a university education. He began university in Berlin in 1899, age 18, taking a variety of science classes. He specialized in astronomy, meteorology, and physics. In 1902 he began a PhD degree in astronomy. He spent a year at Berlin’s famous Urania Observatory, whose purpose was (and still is) to bring astronomy to a wider public. Alfred Wegener completed his astronomy PhD in 1905, age 24. Although qualified to become a professional astronomer, he worried that he might not discover anything new or interesting in astronomy. He believed he could make a greater contribution in meteorology – the study of weather and climate. After completing his doctoral degree, Wegener started work in 1905 as a scientist at a meteorological station near the small German town of Beeskow. There, working with his older brother Kurt, he carried out pioneering work using weather balloons to study air movements. If there had been a Guinness Book of World Records in 1906, the Wegener brothers would have won the record for the longest continuous balloon flight ever: 52.5 hours in April of that year. Wegener was delighted to be appointed as the official meteorologist for the Danmark scientific expedition to Greenland, the world’s largest island, which took place from 1906 to 1908. The expedition’s principle aim was to chart the coastline of Greenland’s unexplored northeast coast. During the expedition, Wegener made his mark by building Greenland’s first meteorological station and taking a large number of atmospheric readings using kites and balloons. The expedition’s work in uncharted territory was dangerous – three expedition members died of starvation/exposure! Returning to Germany in 1908, Wegener became an associate professor in meteorology at the University of Marburg. There he quickly gained a reputation for giving lectures that made difficult topics easy for his students to understand. In 1910 he published his first book: Thermodynamics of the Atmosphere. He also had the first inkling of the idea that would bring him both anguish and long-lasting fame: continental drift. Looking at a world map in 1910, Wegener noticed how the coastlines of eastern South America and western Africa seemed to fit together, rather like jigsaw pieces. 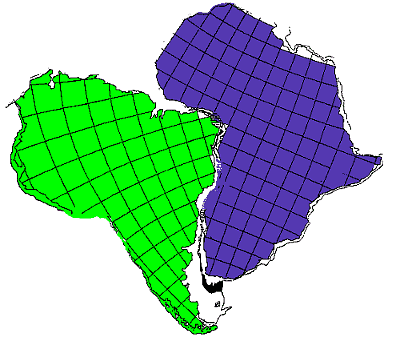 The South American and African continents seem to fit together. After further research, in 1911 Wegener learned that fossils of the same species were present in Brazil and western Africa. This evidence suggested to him that South America and Africa were in physical contact when the animals and plants that became fossils were alive. He researched geological data and found evidence of similar rock formations on the two continents. In 1912, age 32, Wegener gave talks at German universities and published two papers proposing that Earth’s continents moved. His work on continental drift was then interrupted by a second expedition to Greenland followed by the outbreak of World War 1 – Wegener was conscripted into the German Army. Nevertheless, while recovering from a wound in 1915, he wrote and published his groundbreaking book: The Origin of Continents and Oceans, in which he discussed the movement of Earth’s continents. He proposed that many millions of years ago Earth consisted of a single great continent surrounded by ocean. Very slowly the land masses of this huge continent moved apart to form the continents we see today. Unfortunately, nobody took much notice of his proposal! Today we recognize that Wegener’s ancient continent truly existed. We call it by the name Wegener gave it – Pangaea. From The Origin of Continents and Oceans: Alfred Wegener’s view of the supercontinent and superocean that existed on Earth about 300 million years ago. Color added by this website. In 1920, 1922, and 1929 Wegener published updated editions of The Origin of Continents and Oceans, adding more evidence each time for his idea that the continents move around the planet at very slow speeds. He also added further evidence he had gathered in Greenland that it had once been linked to North America. He pointed out that he was not the first person to propose the movement of continents; others had also found evidence from fossils and rocks which strongly suggested continents now far apart were once joined; the American geologist Frank Bursley Taylor had published evidence in 1910 supporting the idea of continental drift. Wegener’s work was independent of Taylors. 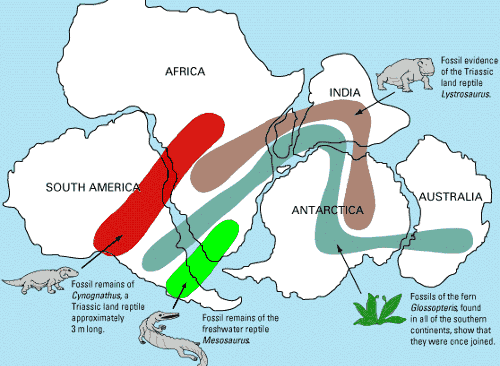 In 1920s America, people referred to continental drift as the Taylor-Wegener theory. Wegener found that identical fossils could be found on different continents, supporting his theory that continents which are now far apart were once linked. Scientists who stray into another field can encounter difficulties, such as those encountered by physicist Luis Alvarez when he proposed a meteor impact had resulted in the extinction of the dinosaurs. Wegener, an astronomer who had become a meteorologist, encountered vigorous resistance to his ideas from a large majority of geologists. In compiling a huge volume of convincing evidence for Pangaea and continental drift he had made one or two small errors, and he also made one big error. Although the rock and fossil evidence he reported should have been more than enough to convince skeptics that his theory was largely correct, Wegener tried to explain why continents move – and got this wrong! Polflucht is German for pole flight. Wegener proposed that there was a geological force which pushed the continents away from Earth’s poles towards the equator. Geologists rightly told him this was untrue. 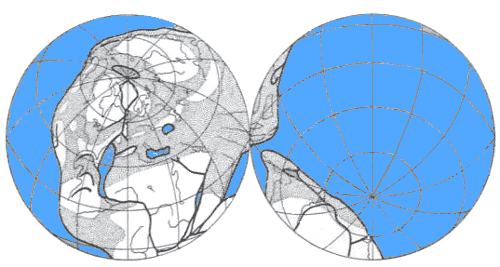 Unfortunately they threw the baby out with the bathwater: they rejected Wegener’s truly compelling evidence for continental drift; and they also rejected work which today we recognize as a forerunner of the correct explanation of continental drift – plate tectonics, the idea that solid continents float on a fluid mantle. Wegener published what would be the final edition of his book The Origin of Continents and Oceans in 1929. On an unknown day in mid-November 1930, Alfred Wegener died at the age of 50 on his fourth expedition to Greenland. He had been trying to resupply a remote camp in very bad weather. Temperatures had dropped as low as a deadly -60 °C (-76 °F). He supplied the camp successfully, but there was not enough food at the camp for him to stay there. He and a colleague, Rasmus Villumsen, took dog sleds to travel to another camp. Wegener died on this journey, probably of a heart attack. Villumsen buried Wegener’s body in the snow and marked the grave with skis. Villumsen then resumed his journey, but did not complete it. His body was never found. 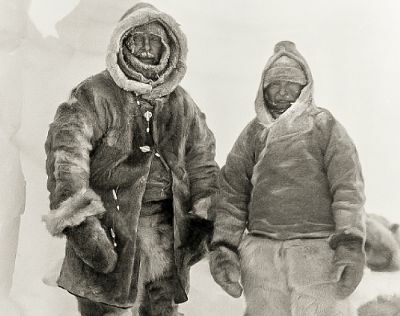 Alfred Wegener (left) and Rasmus Villumsen on November 1 or 2, 1930. November 1 was Wegener’s fiftieth birthday. In May 1931 Kurt Wegener discovered his brother’s grave. He and other expedition members built a pyramid-shaped mausoleum in the ice and snow, and Alfred Wegener’s body was laid to rest in it. The mausoleum has now, with the passing of time, been buried under Greenland’s ice and snow. Alfred Wegener was survived by his wife, Else Köppen, whom he had married in 1913, and two daughters: Sophie Käte and Lotte. “He was a person of flawless character, unadorned simplicity and rare modesty. At the same time, he was a man of action, who, in pursuing an ideal goal, achieved the extraordinary by means of his iron will power and tenacity while putting his life at risk. Today, we recognize that continental drift theory is correct. It was only in the 1960s, when the theory of plate tectonics was recognized as correct, that geologists finally accepted that Wegener’s continental drift theory and the concept of Pangaea were also correct. Wegener’s ideas are now standard concepts in geology, taught to everyone who studies the subject. Color images of Wegener digitally enhanced and colorized by this website. "Alfred Wegener." Famous Scientists. famousscientists.org. 20 Mar. 2015. Web.